In 2015 The Castle Group provided the design/build services for the structural rehabilitation of Pier 68S. Pier 68 South is a timber low deck finger pier built in the 1930’s, located along the Delaware River in Philadelphia, Pennsylvania. 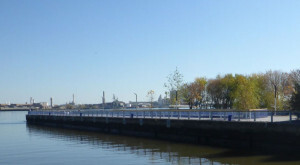 In its original as-built condition, the pier extended into the river approximately 500 feet from the marginal bulkhead on the upriver side and approximately 470 feet from the marginal bulkhead on the downriver side. A portion of the downriver end of the pier has collapsed, exposing the low deck fill. To provide ease of construction and streamline the entire renovation, CASTLE performed Value Engineering for the structural rehabilitation of the pier. Engineering investigation and analysis was completed to determine the materials, and methods for installation of all the repairs. Some of the original proposed repairs remain, however several key areas were redesigned including; the proposed end section, concrete seawall repairs, and tie-rod installation. The end 94 feet of the pier was removed to eliminate the damaged section creating a new end section. The new end section consists of a reinforced concrete wall installed and dowelled into the remaining portions of the original structure. Standard timber pile and shim repairs were made as required. Hydro- Marine Construction Co., Inc. completed the structural repairs for the pier structure.